ایزدی, پانیذ, رحیم نژاد, مصطفی. (1395). حذف سولفید از پساب با استفاده از فناوری جدید پیل سوختی میکربی و تولید همزمان انرژی پاک. مجله آب و فاضلاب, 27(3), 26-31. پانیذ ایزدی; مصطفی رحیم نژاد. "حذف سولفید از پساب با استفاده از فناوری جدید پیل سوختی میکربی و تولید همزمان انرژی پاک". مجله آب و فاضلاب, 27, 3, 1395, 26-31. 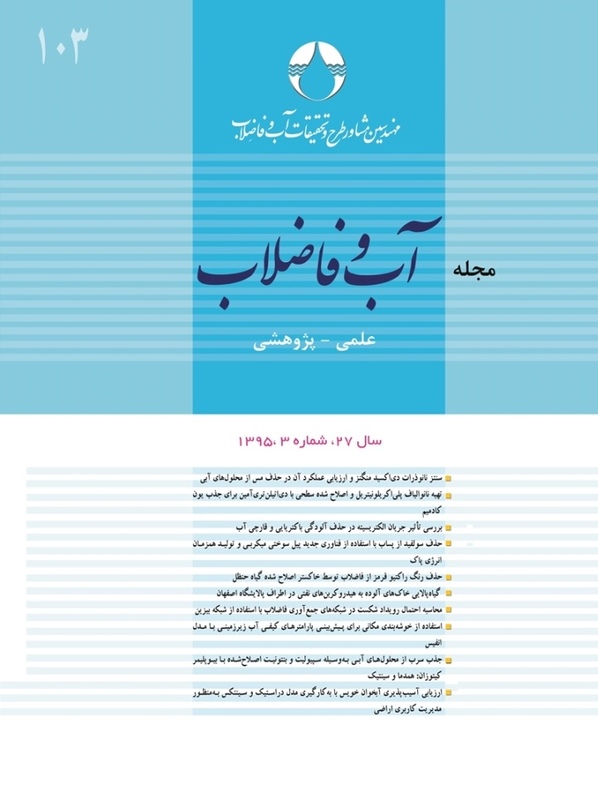 ایزدی, پانیذ, رحیم نژاد, مصطفی. (1395). 'حذف سولفید از پساب با استفاده از فناوری جدید پیل سوختی میکربی و تولید همزمان انرژی پاک', مجله آب و فاضلاب, 27(3), pp. 26-31. ایزدی, پانیذ, رحیم نژاد, مصطفی. حذف سولفید از پساب با استفاده از فناوری جدید پیل سوختی میکربی و تولید همزمان انرژی پاک. مجله آب و فاضلاب, 1395; 27(3): 26-31. تصفیه پساب به‌علت نقش و اهمیت آن مورد توجه پژوهشگران است. تصفیه پساب روش‌های متعددی دارد که معمولاً به‌زمان و هزینه زیادی نیاز دارند. پیل سوختی میکربی روشی نوین است که نگرش جدیدی را برای تولید جریان الکتریسیته و به‌طور همزمان، تصفیه پساب ارائه داده است. سولفید، یون بسیار خطرناکی است که به‌طور متداول در پساب‌ها وجود دارد. در این پژوهش از این یون به‌عنوان دهنده الکترون در محفظه بی‌هوازی استفاده شد و حذف غلظت‌های مختلف آن در پیل سوختی میکربی دو محفظه‌ای مورد بررسی قرار گرفت. افزایش سه غلظت سولفید، 1/0، 8/0 و 1/5 گرم در لیتر به آنولیت بررسی شد. نتایج نشان داد نزدیک به 98 درصد از سولفید موجود در محلول آندی هر سه پیل به‌ترتیب بعد از 21 ساعت، 6 روز و 10 روز حذف شد. همچنین برای بررسی فعالیت الکتروشیمیایی میکروارگانیسم‌ها و اکسایش سولفید در محفظه کاتدی از ولتامتری چرخه‌ای استفاده شد. Wastewater is nowadays a major concern in human societies that has encouraged many scientists to direct their efforts at developing new and efficient methods for its treatment. Most of the methods so far proposed or developed are time-consuming and/or cost intensive. Microbial Fuel Cell (MFC) is a new technique that is capable of direct conversion of the chemical energy due to wastewater treatment into electrical energy. Most treatment processes commonly release sulfide ions that are highly toxic and deterimental. In the method proposed in this study, the sulfide ions generated during wastewater treatment were used as electron donors in the anaerobic compartment of a dual chamber microbial fuel cell and the removal of different concentrations of sulfide ions and the power generated were studied. For this purpose, the effects of three different concentrations of sulfide (0.1, 0.8, and 1.5 g.l‒1) on MFC performance were explored to find that a sulfide removal efficiency of 98% could be achieved after 21h, 6 days, and 10 days, respectively. Also, cyclic voltammetry was used for the detection of electrochemical activity by microorganisms and sulfide oxidation in the anode chamber. 1. Lewis, N. S., and Nocera, D. G. (2006). “Powering the planet: Chemical challenges in solar energy utilization.” Proc. Natl. Acad. Sci., 103, 15729-15735. 2. Logan, B. (2004). “Biologically extracting energy from wastewater: Biohydrogen production and microbial fuel cells.” Environ. Sci. Technol., 38, 160-167. 3. Mohan, Y., and Das, D. (2009). “Effect of ionic strength, cation exchanger and inoculum age on the performance of Microbial Fuel Cells.” Int. J. Hydrogen Energy, 34, 7542-7546. 4. Bard, A. J., and Faulkner, L. R. (1980). Electrochemical methods: Fundamentals and applications, Wiley, New York. 5. Timmers, R. A., Strik, D. P., Hamelers, H. V., and Buisman, C. J. (2010). “Long-term performance of a plant microbial fuel cell with Spartina anglica.” Appl. Microbiol. Biotechnol., 86, 973-981. 6. Palmer, I., Seymour, C. M., and Dams, R. A. (1995). Application of fuel cells to power generation systems. Google Patents, Patents number: 1540-1589. 7. Blomen, L. J., and Mugerwa, M. N. (1993). Fuel cell systems, Plenum Publishing Corporation, New York and London. 8. Allen, R. M., and Bennetto, H. P. (1993). “Microbial fuel-cells.” Appl. Biochem. Biotechnol., 39, 27-40. 9. Rodrigo, M., Canizares, P., Lobato, J., Paz, R., Saez, C., and Linares, J. (2007). “Production of electricity from the treatment of urban waste water using a microbial fuel cell.” J. Power Sources, 169, 198-204. 10. Lee, C.-Y., Ho, K.-L., Lee, D.-J., Su, A., and Chang, J.-S. (2012). “RETRACTED: Electricity harvest from wastewaters using microbial fuel cell with sulfide as sole electron donor.” Int. J. Hydrogen Energy, 37, 15787-15791. 11. Sun, M., Mu, Z.-X., Chen, Y.-P., Sheng, G.-P., Liu, X.-W., Chen, Y.-Z., et al. (2009). “Microbe-assisted sulfide oxidation in the anode of a microbial fuel cell.” Environ. Sci. Technol., 43, 3372-3377. 12. Zhao, F., Rahunen, N., Varcoe, J. R., Roberts, A. J., Avignone-Rossa, C., Thumser, A. E., et al. (2009). “Factors affecting the performance of microbial fuel cells for sulfur pollutants removal.” Biosens. Bioelectron, 24, 1931-1936. 13. Rabaey, K., Van de Sompel, K., Maignien, L., Boon, N., Aelterman, P., Clauwaert, P., et al. (2006). “Microbial fuel cells for sulfide removal.” Environ. Sci. Technol., 40, 5218-5224. 14. Cai, J., and Zheng, P. (2013). “Simultaneous anaerobic sulfide and nitrate removal in microbial fuel cell.” Bioresour. Technol., 128, 760-764. 15. Zhang, B., Zhao, H., Shi, C., Zhou, S., and Ni, J. (2009). “Simultaneous removal of sulfide and organics with vanadium (V) reduction in microbial fuel cells.” J. Chem. Technol. Biotechnol., 84, 1780-1786.